Howdy guys. It's really been a while since I posted some stuff but I promise I will get going again this autumn. Hope you all had a great holiday. Well, summer is over and it's high time to get back to jazz guitar. As you know I have been playing a Mambo 10 Wedge amp for over two years now and it's been a very satisfactory experience so far. I have used the amp at home, jam sessions and gigs and never really felt that it was too "small" or that it lacked headroom. I still think the Mambo 10 is by far the best "small"amp around. With 8 kilos it is extremely portable but, with 180 Watts rms, you have all the volume you need. Are there better amps? Mmm ... not at 8 kilo. Definitely not. Sure, a small amp is a compromise sound wise but hey, I WILL NOT SCHLEPP BIG OR HEAVY AMPS. It's as simple as that. That said, the Mambo 10 has a lovely classic warm jazz sound and will work great for most, if not all combo settings if you can play without the type of headroom rock players are used to. I was kind of excited when Jon Shaw of Mambo amps suggested I try out the Mambo 12 Wedge. Aha ... same amp with a bigger speaker so more headroom. Of course I was curious. The first amp Jon sent me was not to my liking. It was equipped with an Eminence Legend 1218 speaker and it simply sounded not to my taste. Kind of boxy and mid rangey. I liked the sound of my 10 - which carries an Eminence Beta - way better. So I returned it and Jon put an 18 Sound 12W500 speaker in it and sent it back to me. Jon told me this was now the same 12 as he had sold to Kurt Rosenwinkel, who was very pleased with it. And voila ... there it was again. The classic mellow Mambo sound was back! 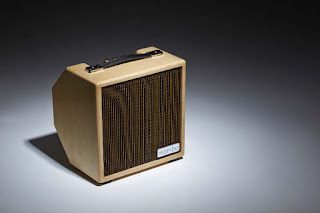 Jon explained to me that he preferred the 18 sound speaker too by far but that somehow many people want an Eminence Legend speaker in their Mambo. Maybe that one sounds better for rock and blues. Dunno. I hated it. I have used the 12 for a few months now and indeed, it has a bit more headroom than the 10. It does not sound "better" though IMHO. I sometimes even prefer the sound of my 10. But, for louder gigs it may be a better choice due to the increased headroom. But that's about it. They are both great amps. There's a lot of technical details I could put here but I am not going to do that. You can read all about the Mambo amps when you click here. The bottom line is that the Mambo amp is a great sounding, loud and extremely portable jazz guitar amp that I will be using for many years to come. I would not know of a better alternative at this size and weight. I don't think it exists. In the video below you can hear a few more clips I recorded and glued together. The tunes are "Sandu", "Four" and "Stolen Moments. "(same take as first video). Watch in HD and run your tablet or laptop through a good set of speakers for a more faithful reproduction if you can. All eq on the amp was flat and the pots on my guitars were open. Jon of Mambo amps (UK based) is a great guy to work with. He will be most happy to answer any questions. His amps are not available in stores but can be directly ordered from his website. Check out the price list. And DO send Jon my regards!